This hike begins at the Bonneville Dam Trail Head just across Hwy 14 from the north end of Bonneville Dam on the Columbia River. 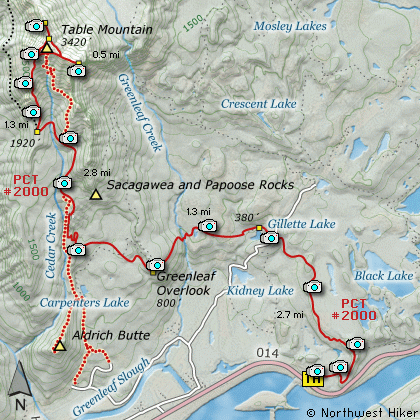 A person can climb Table Mountain by beginning the hike at the same location as the Aldrich Butte hike. But for this CD I am taking the traditional route. The trail leaves the parking area on the east side a climbs a bit as it makes its way to the main trail, the Pacific Crest Trail #2000(PCT). It is about a half mile from the trail head. Upon reaching the PCT, bear left and follow the trail through recently logged areas and across a power line access road to Gillette Lake. The trail continues past the lake on the north side and crosses a small stream then begins a gentle climb toward Greenfield Overlook. You will come to a small pond as you hike through rather dense forest. Just before you come to Greenleaf Creek you will break out into the open. Here you will have a great view of Table Mountain. If you look closely, you will see a rather large waterfall on Greenleaf Creek up on the lower east side of Table Mtn. After this clearing, the trail descends to a very substantial bridge over Greenleaf Creek. After crossing Greenleaf Creek, the trail climbs sharply for a bit as it works its way to the Greenleaf Overlook. Here you will experience excellent views of the Columbia River Gorge looking east, south, and west. The trail continues to climb on its way to Table Mtn. You will walk along and occassionally cross an old logging road as the trail passes through a wet swampy area. After which the trail begins its most serious climbing. At about 5 miles the trail joins with an old road and follows the road for a bit as it continues to climb. This old road can be taken from the Aldrich Butte trail head to climb Table Mtn. You will note that the PCT doesn't really follow this old road bed, but rather follows along side it. I'm not sure why. Never the less in another mile you will come to a significant saddle. The PCT will go on straight ahead and begin to drop. Do NOT follow the PCT past this saddle. Instead you will notice a users trail on the north side of the PCT. Take this small trail and it will lead you to the top of Table Mountain. As you begin the final climb of the mountain the trail becomes very very steep. There are times that you may find yourself using your hands to climb up the steep rocky trail. However, it never seems difficult to follow the trail. As you gain elevation you will be treated to increasingly better views of the surrounding terrain. Finally, the trail breaks out on top of Table Mountain. The top of the mountain is shaped a bit like the letter Y. Just follow the trail to the far north side of the mountain for outstanding views of Mt St Helens, Mt Rainier, and Mt Adams. Then follow the Y part of the trail to the southeast side of the mountain where you will come to an incredible steep and high cliff. USE EXTREME CAUTION while in this area. The trail gets very close to the edge of this cliff. After enjoying the rewards of your climb, you have 2 options for getting off the top of this mountain. I have descended both ways, and I would recommend returning the same way you came up. However, there is a clearly visible trail right down the face of the mountain which eventually ends up back on the PCT which you followed to get there. From Portland, travel east on Interstate Hwy 84 to Exit 44 to Cascade Locks. Exit the freeway and cross over the Columbia River into Washington via the Bridge of the Gods. Then turn left, or west, and head about 2 miles to the Bonneville Trailhead on your right. Park here and begin your hike via a cutoff trail to the PCT. From I-205 exit for SR 14 in Vancouver, WA travel east on SR14 through past Camas and Washougal and past Beacon Rock for about 33 miles and you will come to the Bonneville Trailhead on your left. Park here and begin your hike via a cutoff trail to the PCT.